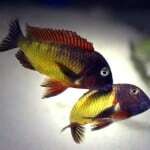 Take a look at our guide to keeping Tropheus cichlids with other fish. Feeding: Spirulina-based flake food supplemented with fresh green vegetables such as romaine lettuce and spinach. Sexing: Males tend to have a turned-up nose while females tend to have a greater slope and rounded nose. 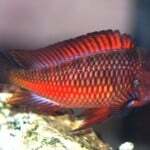 Males will also grow at a faster rate (generally) and display their adult colours sooner. Males’ coloration is also often more bold than females’ because they like to show it off when courting females. Adult males will also tend to have a deeper body, whereas females appear more slim and streamline. 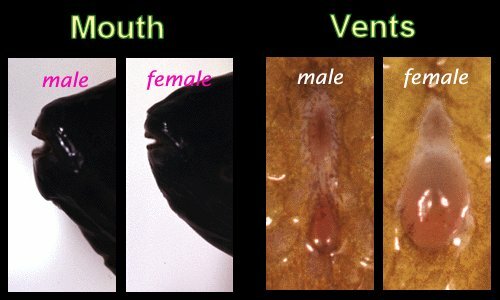 While these characteristics may help an experienced hobbyist, venting is the only sure way to determine gender with Tropheus. 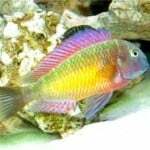 Males and females of the Tropheus Mpimbwe are very different in colour and easily distinguished making putting a strong breeding group together very easy to do. 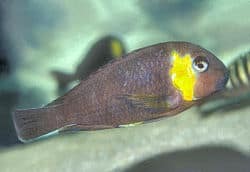 Males exhibit a patch of yellowish or reddish colour behind the head however females will retain their juvenile yellow stripes. 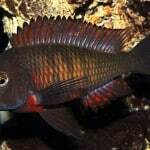 Breeding: Males are quite territorial and are aggressive in their attempts to coax females to spawn. They never seem to tire of this either – males want to spawn every minute of the day. This fish should never be kept in 1:1 ratios. One male to three or four females is an ideal ratio, but keep in mind that the only correct way to keep this species in captivity is in a group of ten or more individuals. 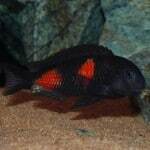 The most difficult challenge to breeding Tropheus is bringing the females into spawning condition. 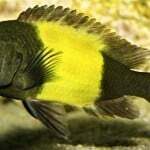 Additional Information: Even though Tropheus species are hearty, keeping them is not without challenges. 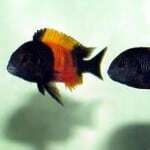 The Tropheus fish can be the most rewarding of cichlid to keep though due to the rich colouration and constant activity of the fish. 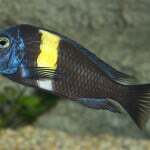 Locals of the area in which these are captured report the average size to be around 20cm so it is slightly larger than the average Tropheus, reasons for this are unknown however it does mean that a larger than normal aquarium is required to house this Tropheus variant to ensure they exhibit their natural behaviour.